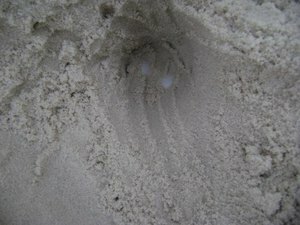 Well, all of the volunteers started doing our dawn turtle patrols the first week of May, and yesterday turned out to be the day we found the first nest on St. George Island of the 2009 nesting season. It has been blowing like a sustained tropical storm for about 3 days now. Rain the first day, then just wind with a little spattering of rain up here - just enough to make your hair curly. I was chugging along (in jacket and long pants - unheard of for May) on my 1.5 mile stretch that I've been assigned this year, arguing with myself about walking the whole way. Since the wind was blowing so hard from my back, I knew darn well it was going to be a tough walk back into the wind. And then, there were the tracks. Already blown over pretty well, but definitely tracks. And yes, there was the nest site, perfectly executed, just windblown. 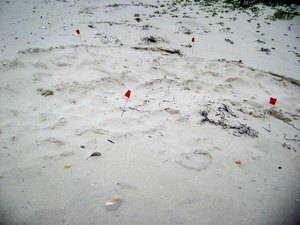 I didn't have my poles and GPS with me, so marked the site with red flags to come back to. I finished on down to the end of my stretch, turned around, and when I got back to the nest site, it had already deteriorated, so I went ahead and located the egg clutch and marked the corners. 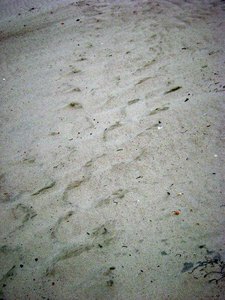 The sand was damp and really cool, but the eggs were easy to locate, right there towards the back of the nest site, where she had thrown the sand behind her as she was finishing up. Those are the eggs in the egg clutch in the bottom picture - we just uncover them enough to verify that it is really a nest, and to pinpoint the exact location of the egg clutch in the much larger nest site the mother turtle leaves, so that we can mark it precisely with the poles and the yellow signs. After we find the tops of the eggs, we cover the egg clutch back up quickly, and keep the sand level around it as close to that left by the mother turtle as possible. It was a good thing I went ahead and located the egg clutch when I did - by the time I got back home, and back down there in my car with all the poles, etc., (7:45AM by this time) the tracks were gone completely. Anyway, YAY first turtle nest of the season - it begins again! !